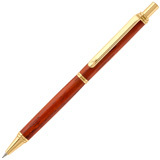 Just like turning a wooden pen, twist and click pencil kits are also turned using a pen mandrel with bushings. 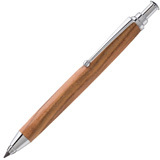 A pen and pencil set make a perfect gift, especially when you use matching exotic wood blanks. In additional to traditional pencil kits, we also offer 5.6mm sketch and toolbox pen kits perfect for drawing, sketching or general woodshop use.